I thought something was wrong. 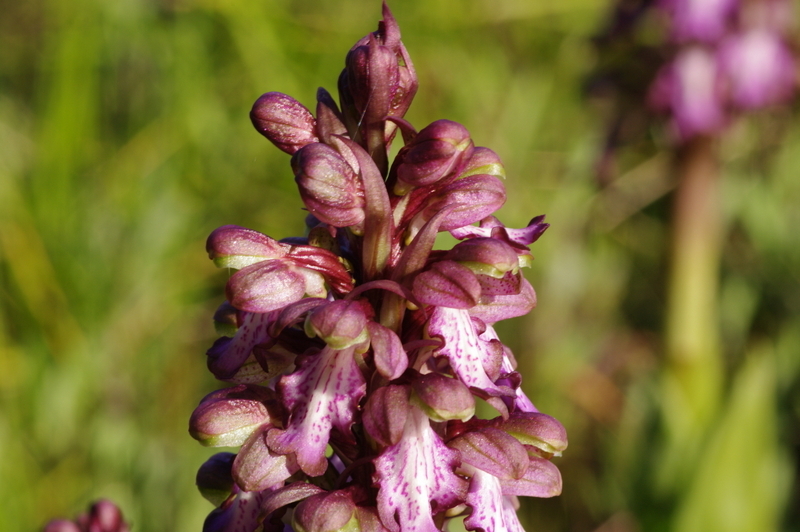 In my last post I mentioned a sighting of Lady orchids recently- with a picture – and I did say it didn’t quite match with other pictures of Orchis purpurea (Lady Orchid). That’s because it was no Lady, it was a Giant orchid (Himantoglossum robertianum). Since the subject of the post was not seeing things, overlooking a giant seems quite appropriate. There are some mitigating circumstances I’ll claim in my defence. The giant orchid has gone through a more bewildering variety of names than a wanted criminal. It was first described by a French botanist with a fine name himself: Jean-Louis-Auguste Loiseleur-Deslongchamps (1774-1849). He was a doctor interested in the medical uses of plants, and named the orchid Orchis robertiana for his friend, G-N Robert (1776-1857), a botanist from Toulon. 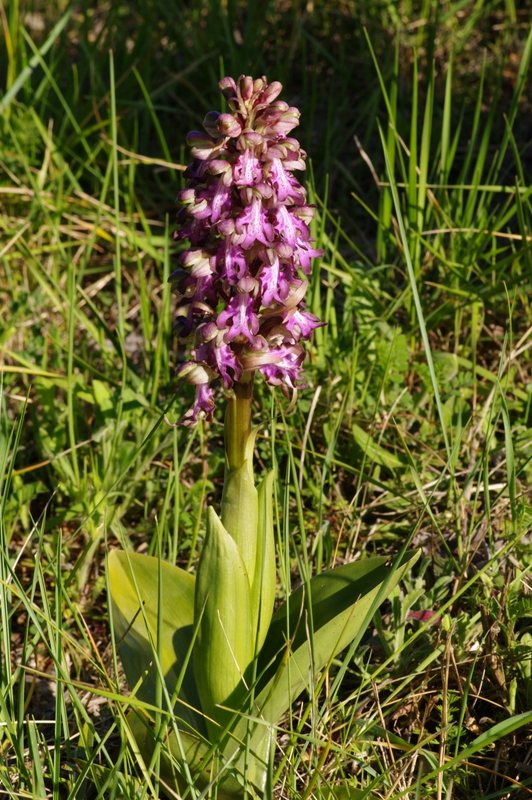 In French it can be listed as orchis géant, orchis à longues bractées, or Barlie, after Jean-Baptiste Barla (1817-96), a naturalist from Nice particularly interested in orchids . In 1967 it became known as Barlia robertiana – but though it is listed like this in many older Flora, including my favourite Wild Flowers of the Mediterranean, Barlia does not exist any more as a valid genus name. In 1999 Pierre Delforge put the giant orchid into the Himantoglossum genus – this was resisted by most taxonomists till the name was accepted finally in 2009. If you’re confused by now you’ll be glad to know that I’ve no idea where the name of this genus came from. If you ever want to check what name is currently accepted, the authoritative list is on http://www.theplantlist.org/. I’ve also seen it listed as H. longibracteatum, due to the long narrow bracts, longer than the flowers and pointing upwards, which are a distinguishing feature for this species,but this isn’t the accepted name now. Secondly it does vary quite a bit in appearance: though the flowers are usually a deep pink with a white central area on the long lip, and purple stripes on the sepals, there are varieties which are white and green. Thirdly, it is rare in France. 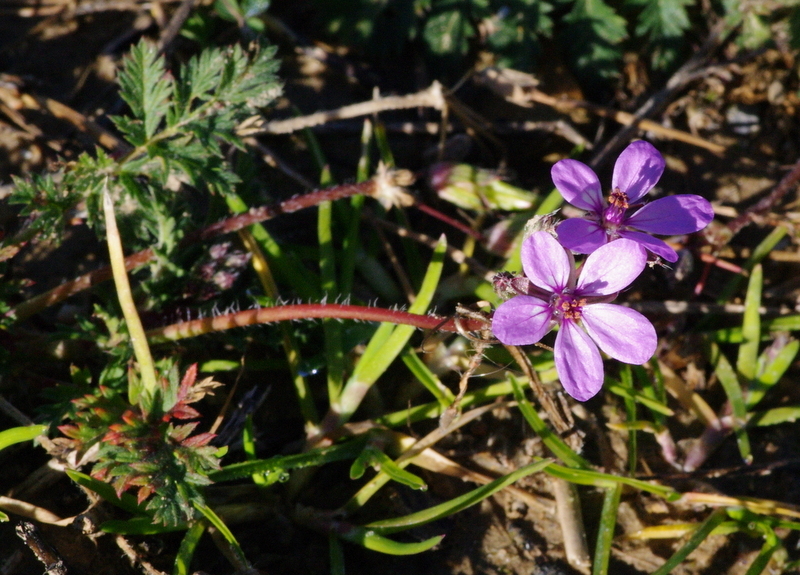 It’s common in my area of the Hérault, but rare elsewhere and so several guides suggest it is protected. 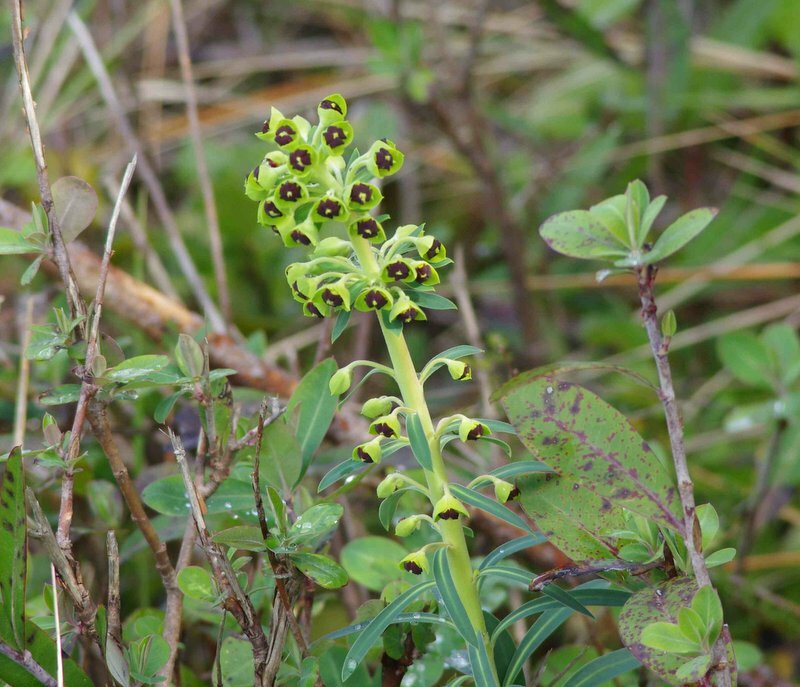 It is on the Red List of orchids in France which are threatened (along with 168 others) – but it’s judged to be at small risk of disappearance. 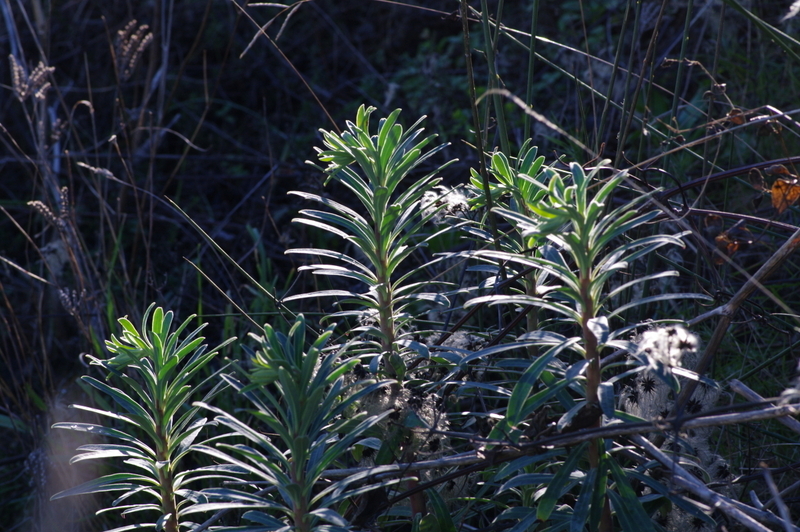 Thanks to its underground tubers it can lie low if overgrown by taller garrigue plants or bushes, and can reappear when land is cleared of brush, or when overgrown verges are mown. 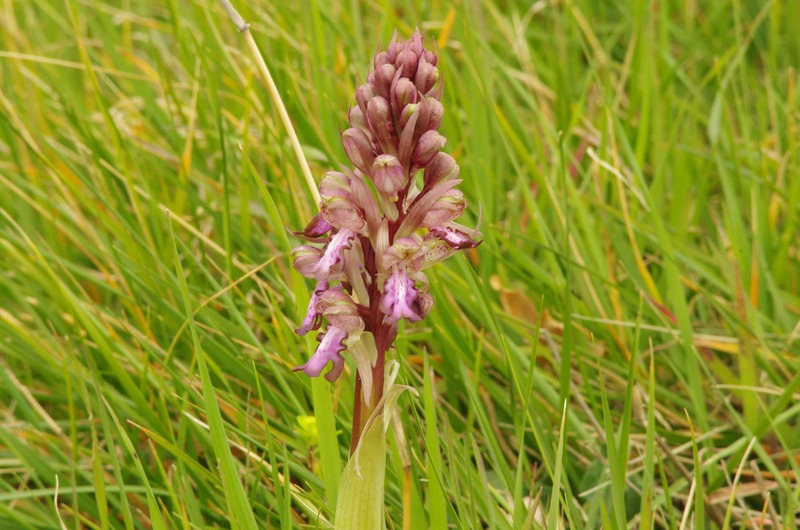 It’s one of the earliest orchids to flower –from February to April. Of course I’ll try in future – as I always do – to name flowers correctly – but it’s interesting chasing an identification, and I’ve learnt something about French botanists. I’ll go back and change the last post – I always do this if I discover a mistake. All photos in this post were new ones taken by me this week, on 26th March. Coming up next: the plant book everyone should read. Note the characteristic violet-brown nectar glands. 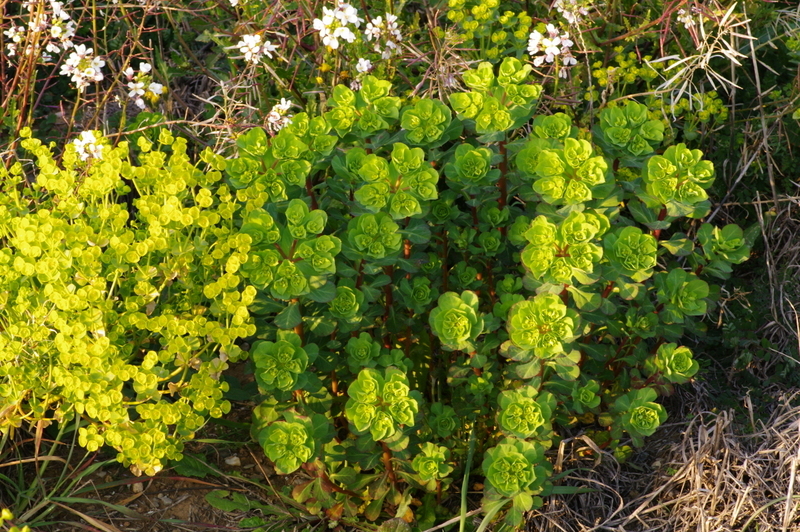 Now last year I hadn’t even registered that all these clumps of this spurge existed, even though I must have ‘seen’ them. An orchid I first thought was the Lady orchid (Orchis purpurea). Although it’s not exactly like the one I blogged last year here, the species does seem quite variable (the reliable site FloreAlpes has a very varied photogallery here). Eventually I found a better identification – Himantoglossum robertianum (see next post). 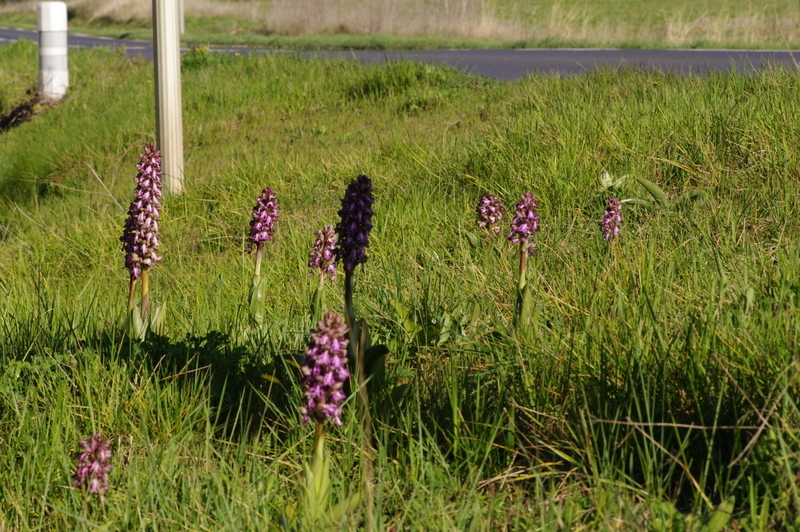 Now as of today I’ve seen dozens of these this year on the roadsides near my village, solitary like this and in clumps, but note the date on last year’s blog: May 21st. Again, what was I looking at during last March and April? Now this is partly due to what I call the Reliant Robin Effect: I used to have one of those peculiar three-wheeled cars because I could drive it on my motorbike licence, and I suddenly noticed for the first time how many of them there were on the road. I also used to teach psychology, and I know this is called salience: we pay most attention to things most relevant (salient) to us, but I think there’s a bit more to it. Plants have more meaning to me now: they remind me of comments and conversations and are a part of the things I want to do. Sightings also link in to some of my other ideas, about ecology, evolution and environmentalism for example. And you have to be curious, to want to understand better – just wanting to collect plants isn’t enough. There’s a worrying side to all this too, of course: if I’m paying more attention to plants, what are all the other things I could be noticing, which aren’t yet salient to me? And what has all this botany replaced – what have I stopped seeing? These lines of thought fitted well with a book I read this week which made a big impression on me – I’ll review it next time. I never need much of an excuse to play a song by Billie Holiday, and this seemed, well, salient: I’ll be seeing you. This is all about scale and distance. When I’m standing looking at the ground, there seems to be nothing flowering, just a lot of low leaf growth. But if I bend over and look closely, in the green around my shoes there are a few points of colour. 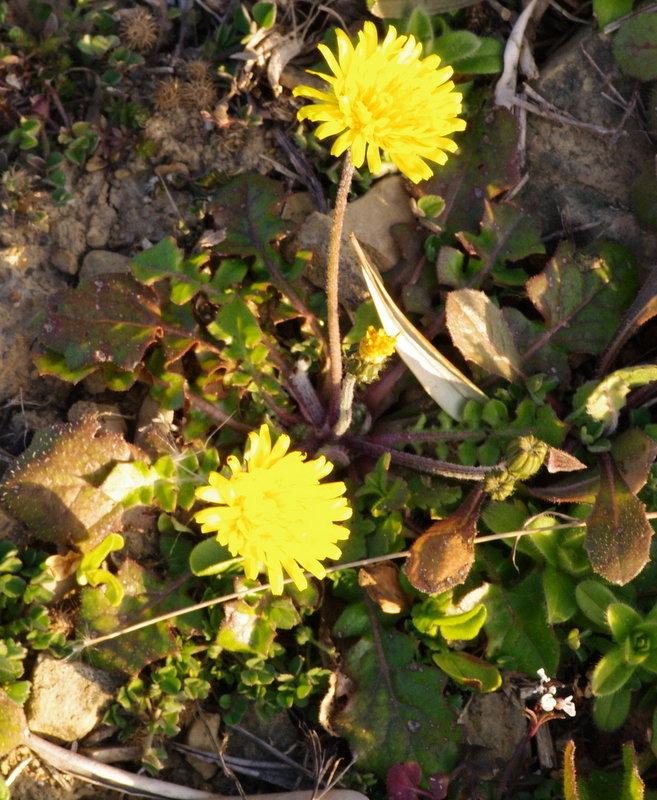 Winter and early spring flowers seem to be mostly small – I suppose the plants are running on their reserves in swollen roots, or on the small amount of solar energy from the winter sun. So in this post I’ve tried to get closer with the macro lens and see how amazing these little flowers are. Here’s one of the prettiest, just visible in the centre of the first photo – but only showing its full splendour when photographed in macro and enlarged. It’s Veronica persica, Persian or bird’s eye speedwell, distinguished from similar species by its deep colour, prostrate habit and flower stalks longer than the leaves. I took this picture in January. The way these flowers are studded in the ground cover reminded me of a garden in Wales: the cloister garden at Aberglasney in Carmarthenshire, where small flowers were planted in formal grass beds or parterres, an effect called ‘enamelling’ – you can see Aberglasney here. This garden fashion dates from around 1600, and contrary to today’s tastes, the ideal viewing point was thought to be well above – hence the raised stone walkway round the cloister, which originally caused some scratching of heads among the garden restorers at Aberglasney. This style of planting replaced the earlier formal garden habit of carefully shaped flower beds surrounded by box hedges, also best seen from a terrace or walkway above, and called compartiments de broderie. Embroidery, or enamel brooches: Nature was not only to be tamed, but miniaturised enough to be held in the hand. Anyway, for 21st-century tastes, on with the magnifications, and here’s another deadnettle I found this week. 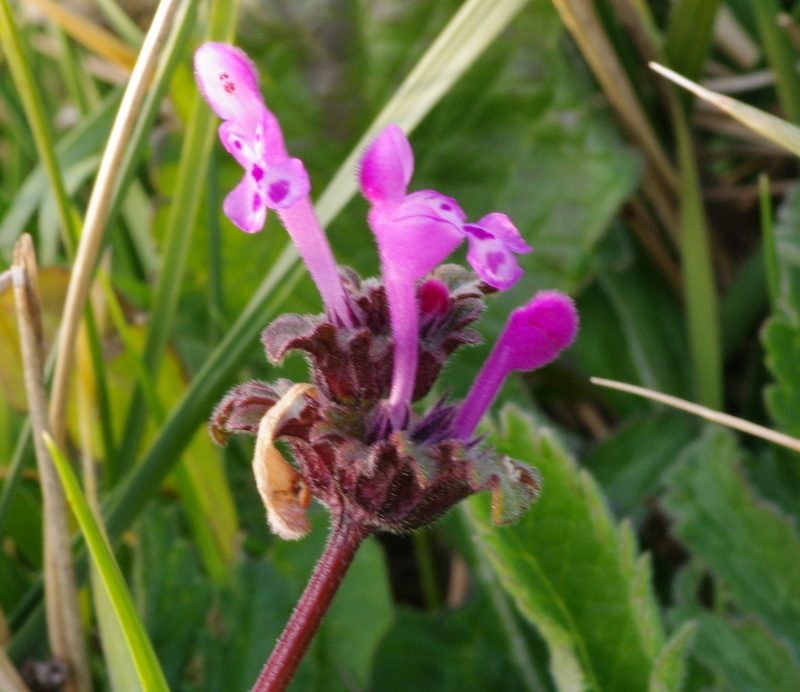 If you compare it to the plant in the last post, you can see that in this one, the henbit deadnettle (Lamium amplexicaule), the leaves are unstalked, enclosing the stem, and the flowers have a much longer corolla tube. 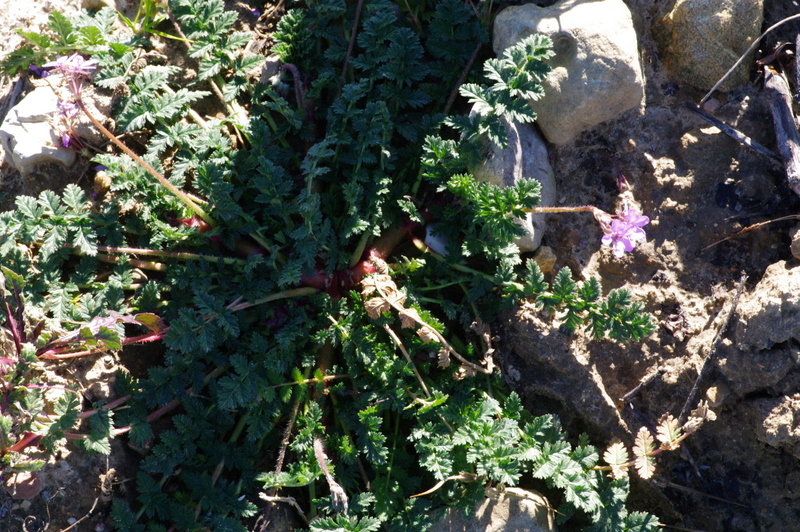 I also found another stork’s bill (Erodium) – I blogged E malacoides on 8th December here. This one’s E. cicutarium, common stork’s bill, also from January, though there are a couple in the right of the first picture too. You can see the characteristically pinnately-lobed leaves (lobes in rows each side of the stalk), deeply cut in this species, which also has fleshy stems. True Geranium flowers are often similar to those of stork’s bills, but the leaves are always palmately lobed in that genus, radiating like fingers from a palm. Then a few puzzles. Here are some grape hyacinths coming up – but which ones? I’d have to go back when they’re fully open, but mostly here I see the tasselled Muscari comosum, which I blogged on 3rd September here. 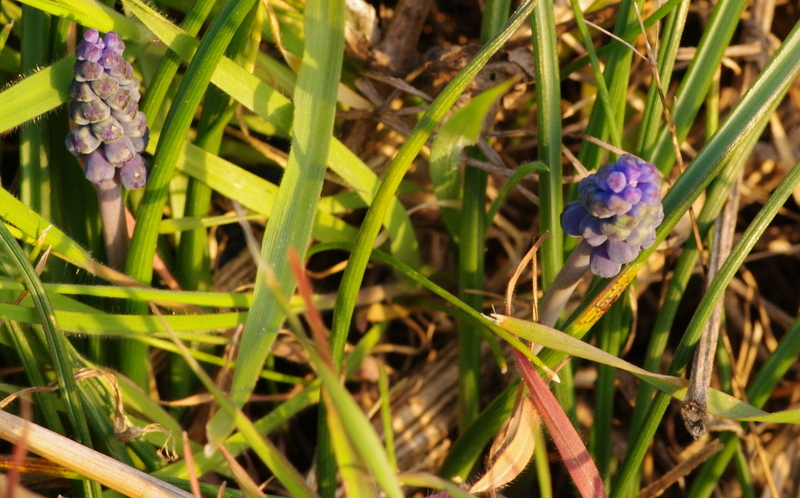 These could be Muscari neglectum – common grape hyacinth. 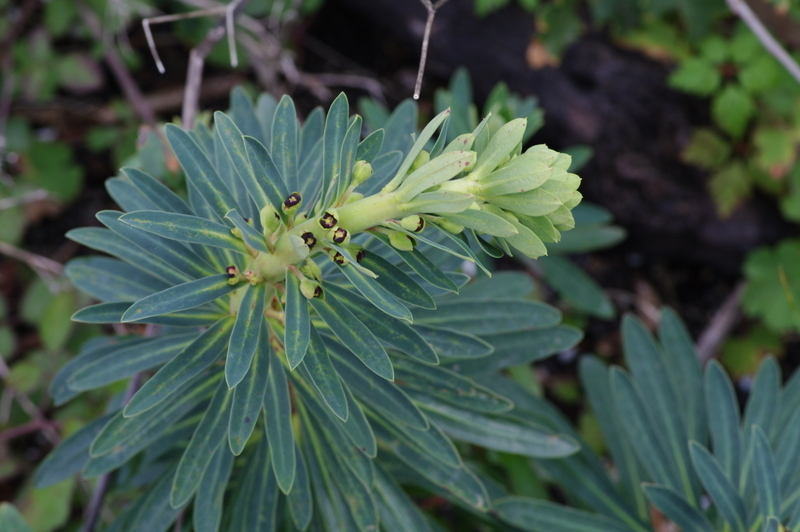 Then a lovely spurge which I can’t identify till it opens fully. 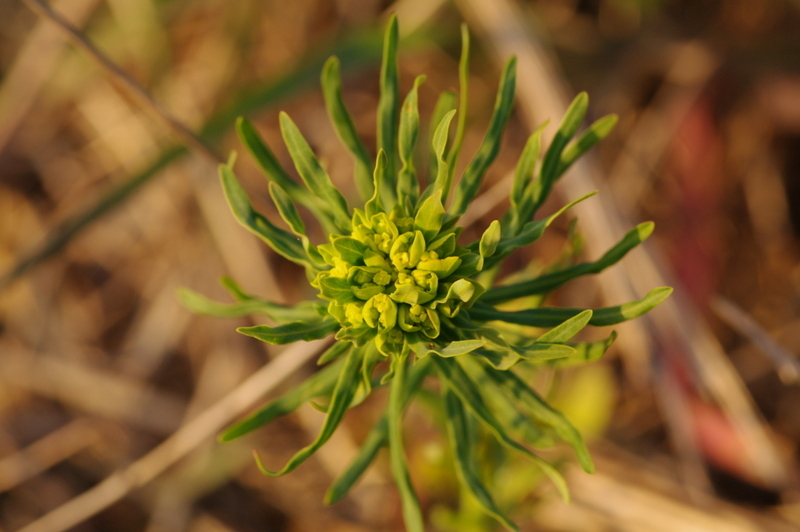 Spurge – Euphorbia – but which one? 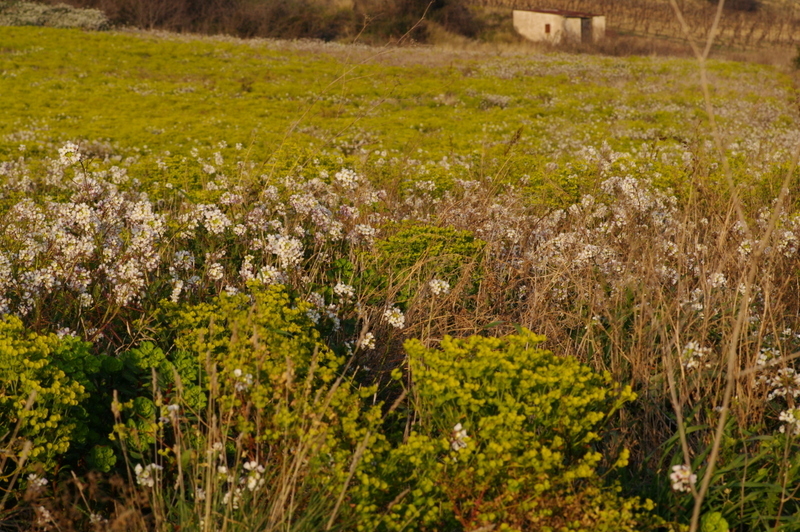 On the opposite side of the road the yellow heads of Euphorbia segetalis had fully colonised a neglected vineyard (with a few beautiful big sun spurges – E. helioscopa). You know I have a thing about spurges, and this sight made my day. 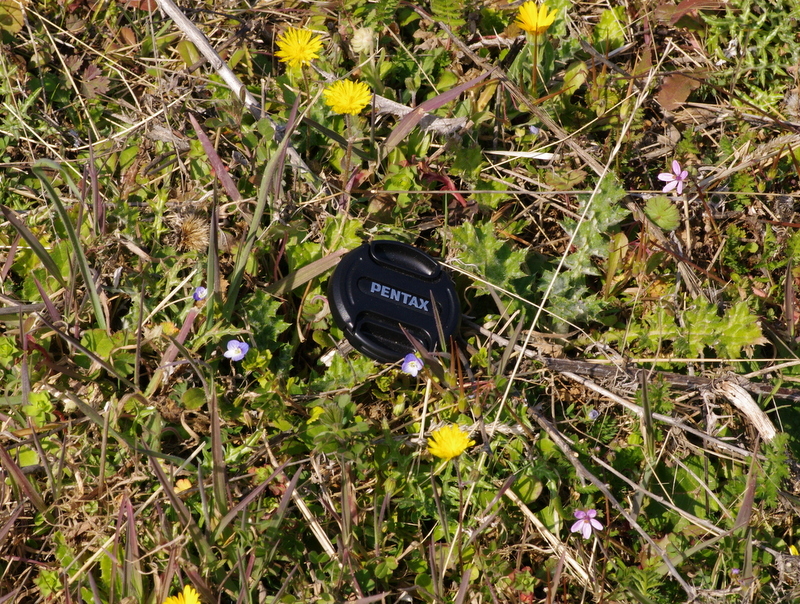 Hawkweed – a species of Hieracium? I think they’re a species of hawkweed (Hieracium) but since there are at least 800 species I’m not going to try to guess which one. Curiously they can produce seed asexually, and thus produce lots of identical clones in a neighbourhood, and it’s hard to tell what’s a clone or variety and what’s a species. If you count all the different forms described for this genus, there are 10,000! 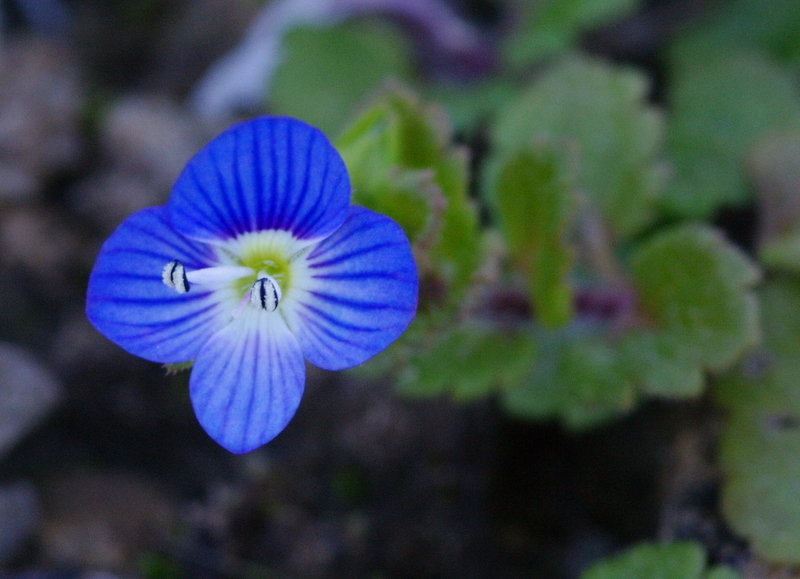 Back to the title of this post and the lovely blue speedwell, this is ‘Veronica’, written by Elvis Costello with Paul McCartney, and about Elvis Costello’s grandmother. It’s on the album Spike (1989), his first album for Warners. He had songwriting skill to burn in those days – so many strong songs on one album. This version is from 1989, live outside the offices of his new record label, and acoustic, showing Costello’s fine vocals and driving guitar chord playing which still captures the song’s falling bass lines. The Warner Bros staff don’t look like the most responsive audience he’s ever had – no wonder he shouts ‘Back to work!’ at the end.